As Zimbabwe rapidly approaches this month’s critical presidential elections, an all too familiar story is once again unfolding within this politically troubled nation. HARARE, ZIMBABWE – As Zimbabwe rapidly approaches this month’s critical presidential elections, an all too familiar story is once again unfolding within this politically troubled nation. Prime Minister Morgan Tsvangirai, leader of the Movement for Democratic Change – Tsvangirai (MDC-T) party, has said he has discounted the possibility of a free and fair election. This comes a few days after a Constitutional Court denial of his appeal to have the July 31 election date postponed because of the government’s inability to implement crucial electoral reforms. Tsvangirai, who is the biggest threat to end 89 year-old President Robert Mugabe’s 33 year strangle-hold on the country’s leadership, has been part of Zimbabwe’s beleaguered Government of National Unity (GNU) — a partnership between his MDC-T and Mugabe’s ZANU-PF parties — since 2009. Mugabe reluctantly agreed to the adoption of a unity government amidst intense international pressure a year after the debacle that was the 2008 presidential elections. It was these elections five years ago which saw rampant corruption and violent and bloody intimidation tactics adopted by Mugabe supporters in a successful attempt to steal the election away from Tsvangirai. After tasting initial victory in the first round of polls, the current Prime Minister was forced to withdraw his presidential bid in fear of his and his supporters’ lives. It is the painful scars and vivid memories of those last elections that have Tsvangirai and other observers worried. 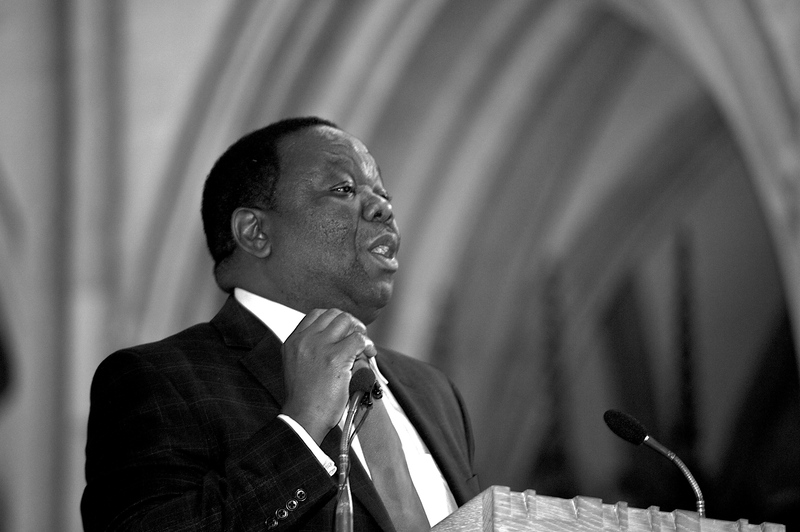 Tsvangirai’s repeated attempts to pass reforms on electoral laws and within the security and media sectors have been thwarted at every turn leaving him no choice but to begrudgingly enter the election process under what he has called “an uneven playing field”. “We are faced with an election without reforms and against a leopard that has remained faithful to its spots,” Tsvangirai told a crowd of 10,000 supporters at his campaign launch this past weekend. “Our faith in God and our collective desire for real transformation will make us triumph over the temporary setbacks,” he said. The temporary setbacks he speaks of, however, have plagued the country for years and show no signs of being resolved in the few weeks remaining before the big day. One of the country’s main obstacles remains a severe lack of money to fund both individual party campaigns and necessary election infrastructure. Tendai Biti, Zimbabwe’s Finance Minister, recently went so far as to compare trying to find enough money to fund the election with trying to squeeze water from a rock. He has floated ideas of compelling some of Zimbabwe’s lucrative diamond mines to fund the election process as well as implement a tax of a few cents on gas every time someone fills up in order to try and raise the $132 million he estimates necessary. So far his efforts have proved fruitless, and many are worried the country is simply unprepared. In addition, many observers, opposition members and potential voters have accused Mugabe’s ZANU-PF and its cohorts of deliberately and blatantly rigging the process. Much of the blame has been directed towards the Registrar General’s (RG) Office and the ZANU-PF appointed employees who work there. The RG is responsible for dispensing birth certificates and national I.D cards, required documents for a voter to be able to register at voter registration booths set up across the country. The mandatory 30 day voter registration period, which comes to an end this week, has been marred by chaotic scenes as thousands of people have had to line up for hours on end, in some cases even overnight, as they wait to get their I.D’s. Once their I.D’s are procured, these same people must then go and wait in the voter registration line, therefore almost comically waiting in line to wait in line. Many here feel the delays are rooted in something more than the usual Zimbabwean inefficiency and are a deliberate attempt to frustrate people out of voting. In rural areas, where support for Mugabe is high, lines have been almost non-existent. In urban areas, however, where support for Tsvangirai is high, people sleeping and cooking in lines snaking around street corners have been commonplace all month, leading to fears that thousands of potential voters will not register in time. As if to put the bitter icing on this undesirable cake, gross voters’ roll irregularities have been unearthed. In an early July report released by local think-tank Research and Advocacy Unit, “in 78 of Zimbabwe’s 210 constituencies, the number of registered voters exceeds the total population there” raising fears of double voting and creating a situation reminiscent of 2008 when thousands of dead people somehow found themselves on the voters roll voting for ZANU-PF. With three weeks to go before elections the country is on a precipice. While the last thing most people want is a recreation of the terror of 2008 it is undoubtedly playing in the back of their minds as the future lies in the balance.